We can make your old car look like a shiny new one by using the Respray Technology. Just pick the color that you prefer! Gun Metal Grey, Red, Blue and Black are currently available with re-upholstered seats to match. The featured image of 3 backrests shows a red/cream option as well as a flat blue/cream and a mottled blue/cream option. These are just a few of the colour options available. Plain grey or cream are also very attractive. Your Old seats can be re-upholstered and be made to look brand new again. 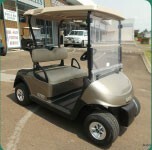 The image shown is a set of seats for a Club Car Precedent but we can get seats done for most models of carts. We can arrange to have the seats match the body as well. Price : $295 per set.